Having a wedding planner for a mother can teach you a lot about weddings, but when it comes to love, Louna has only Ethan to go on. And the brief and intense relationship with him could hardly be considered typical, in that it ended when Ethan was tragically killed in a school shooting. It's hard to find anyone who can measure up to that. Louna has little interest in finding a replacement, especially not Ambrose, the entitled son of a client who comes to work weddings with them during the summer before college. But, as one might predict, with time Louna comes to see Ambrose as a viable partner. 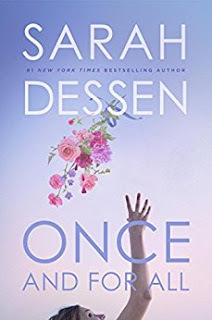 The release of a new Sarah Dessen novel is a Big Deal in the world of Young Adult literature. As one of the most commercially successful (but critically overlooked) contemporary authors in the genre, getting a hold of her latest book is an Event. She writes exceedingly well, but over time I have found her stories more and more formulaic. There's only so far one can go with white suburban North Carolina girls just graduated from high school who meet maddeningly cryptic gentle and intelligent white boys with little or no family of their own in the picture. She writes these girls well and always manages to include interesting quirks and ideas, but they are largely interchangeable. The story about her doomed relationship with Ethan, the shooter victim, while way over-the-top as a concept, was actually the most original part of the story and more interesting that the rough and tumble of her thing with Ambrose. In sum, it's an average Dessen book. Not one of her best, but still so much better than almost anything else out there.